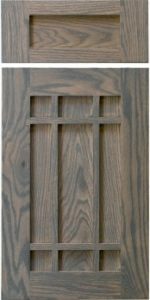 San Raphael is a 9 lite offset mullion door with a veneered panel instead of glass. The corner lites are 2 x 2 regardless of door size. Framing is 2-3/4″. This door is a great accent door, but probably overkill for the whole kitchen. Quarter Sawn Red or White oak is a great choice for this door. Quarter Sawn White or Red Oak is a great choice for this door.